A turbocharger is a very efficient way of creating massive power by recycling exhaust gasses and converting them to create pressurized air intake. The technology has become so popular, a lot of modern vehicles use them for increased power and overall fuel economy. The downside to turbocharging is the use of hot exhaust. This hot air is very, very hot and can cause excessive wear on the turbocharger and nearby parts. The same hot air is pressurized by the turbo and pushed into the vehicle. Engines would much rather have cold air than steaming hot air, so we need to drop intake temperatures between the turbo and the carburetor, but how? Their are several ways to accomplish this. Turbo Camaro has a DevilsOwn alcohol injection kit and a FantasyMotorSports 28x9x2.5" bar & plate front mount intercooler plumbed with 3" stainless steel pipes. 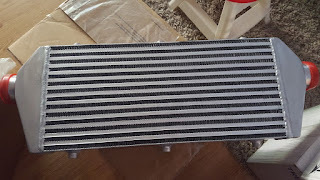 The intercooler was picked up on eBay for about $85US. The intercooler is mounted between the radiator and the front grille for maximum air exposure. 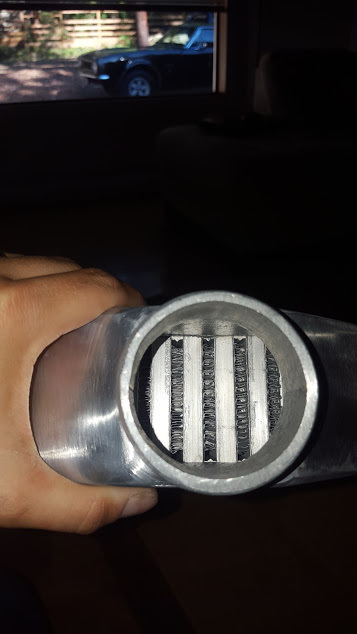 Air comes in through the Spectre cone filter, into the turbo where it comes out and goes through piping into the intercooler. The air cooled passages of the intercooler cool the internal air and it comes out and makes its way toward the carburetor where it gets misted with alcohol from the DevilsOwn injector. This setup significantly cools the intake charge while increasing performance. The grille clearance of a first generation Camaro is almost 3" inches of total depth, over 40" of width, but the height is restricted by a bumper/hood latch support rail right down the middle of the car (vertically) . You must purchase an intercooler to fit the space or modify the rail to allow a larger intercooler. 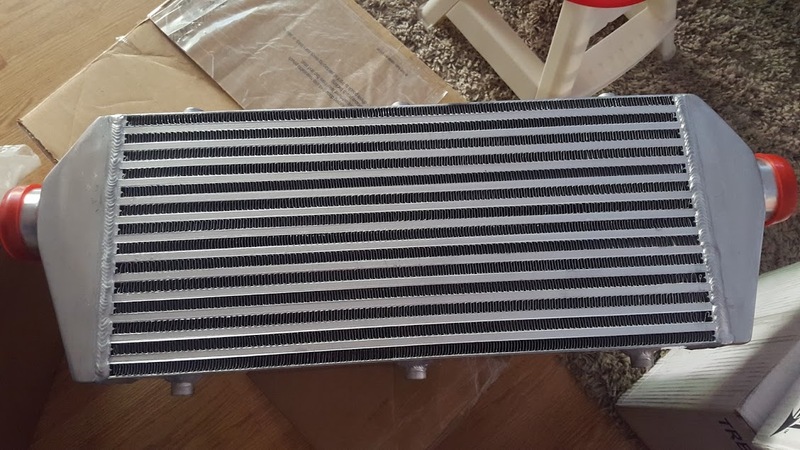 The intercooler mentioned above fits a 67' Camaro perfectly and is a common size, so you don't need to custom order it. It would have been ideal to use a 3" wide intercooler (with matching 3" depth) but it would require further modification of the rail. An intercooler is a fairly cheap item that has a big job. If your planning to turbocharger, or just want to master cold air intake, you should consider picking one up.